Facing northeast, Ramble Rock can take some time to dry out. 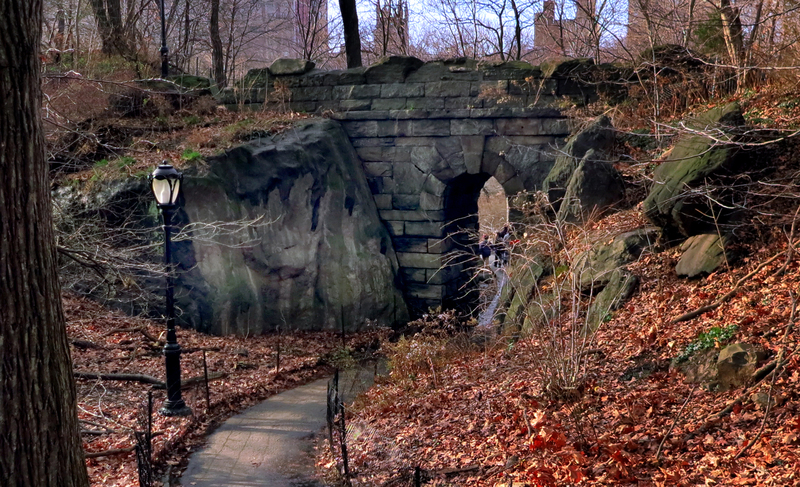 Ramble Rock is found tucked against the southeast corner of the Rustic Stone Arch Bridge (aka Ramble Stone Arch) in the western part of the Central Park Rambles. The Rambles is found immediately north of The Lake and Bow Bridge. It is a hilly, wooded, sylvan area of meandering pathways, dotted with small boulders. 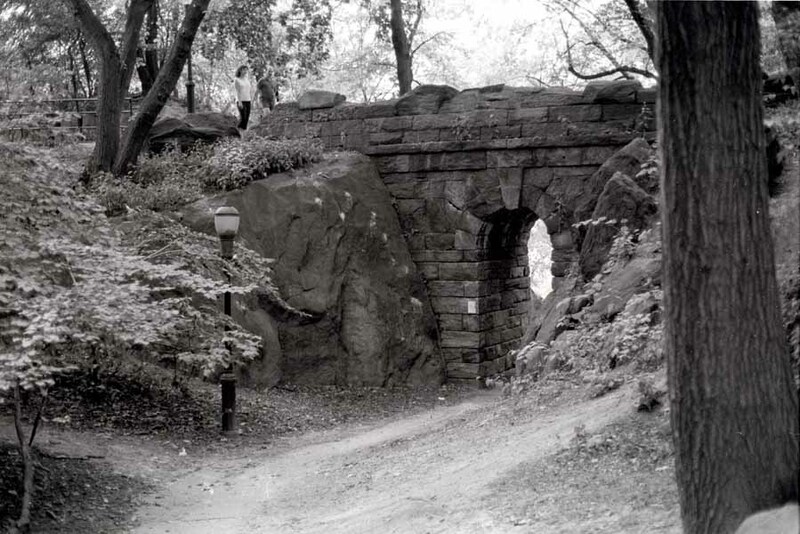 Access: Enter Central Park at 77th Street and Central Park West. Follow the 77th Street entrance down to West Drive. Cross West Drive to gain the foot/bridle path that borders the western shoreline of The Lake. Follow the wide path north until you can turn right and cross the northern part of the Lake by way of a large bridge. On the other side of the bridge, bear right and follow the smaller pathway along the shore of the other side of the lake. At the very next split in the path, go straight. You should see the Rustic Stone Arch immediately ahead. You will find Ramble Rock on the other side. Ramble Rock is, like so many boulders in the park, small. However, like so many of these small boulders, the climbing is high-quality. A number of interesting side-pulls, fins and gastons. Again, if only a little taller and bigger! Conditions vary. In the summer, it can be dank and urine-y. In the winter, dark and cold. The rounded top allows for a lot of seepage. Wait for extended dry weather to visit. Because of that, it is also recommended to survey the top of the boulder before attempting one of the vertical problems. Finishing the vertical problems on Ramble means mantling onto a sloping top with sloping holds. Unfortunately, the fun can be spoiled by hidden, wet, mossy rock. All of the listed problems were climbed with low starts. Not sit-starts. 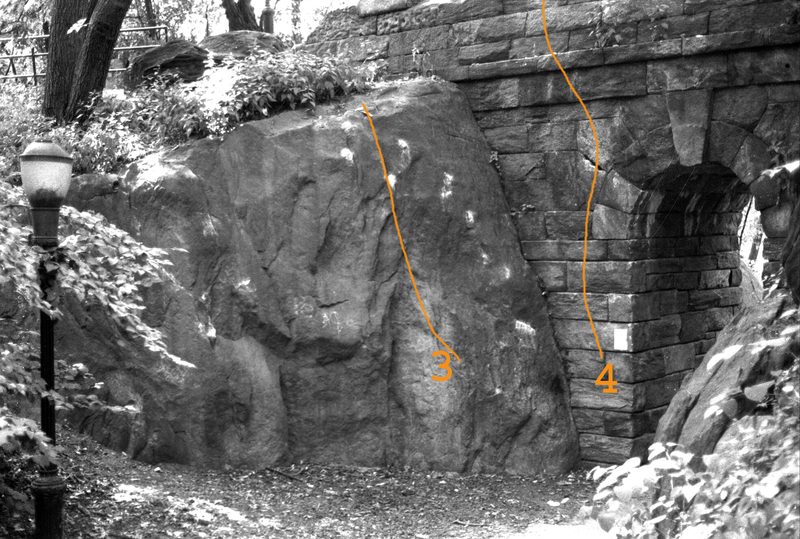 Start: Right side of the main boulder face, near the corner created by the Rustic Stone Arch: find an obvious/good horizontal edge. Go: Move left and up, following the arching line of edges and side-pulls to complete a high traverse. Go: Straight left, completing a low traverse of the boulder. 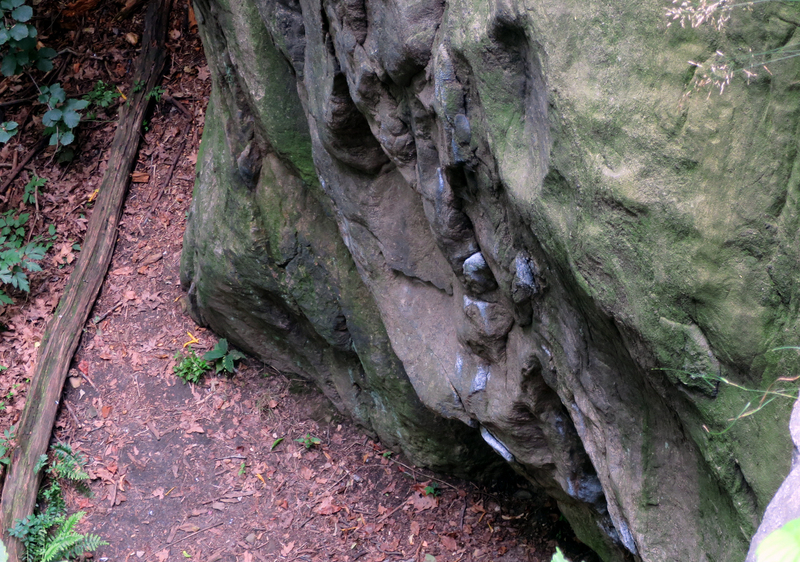 Start: Slightly right of center of the boulder, find a low, obvious right-facing side-pull. Go: Up and slightly left into a shallow groove with an assortment of flakes, slopers, edges and knobs. Finish on the slopey, scary top-out ... which just might be the crux. Variation: Coney Island White Fish V4 Start up Rambo, but as soon as you gain the large, sloping edge out left for your feet, move left to the next groove/flake system and climb up via slopers and a mantle not nearly as exciting as on Rambo. Start: At the narrow low-angle face that is adjacent with the Rustic Stone Arch, where a good/obvious starting horizontal edge awaits you. Go: Up the low-angle face, not using any part of the stone arch. When originally climbed, there wasn't any sort of fence in place. The current one complicates things a bit. One should keep in mind a few things before attempting this problem: 1. Low-angle face problems can create awkward falls, even if the landing area is fairly solid. 2. The current fence at the base takes away far too much of the landing area. 3. Ramble Rock seeps when it's wet. It seeps a lot in that corner between the boulder and the arch. And takes a long time to dry. ***Again, it is highly recommended to survey the top-outs beforehand and make sure there are no surprises up there ... especially wet, mossy rock. Start: Just to the right of Ramble Rock, on the southeast outer face of the Stone Arch. Go: Up to the obvious jug, then to the lip and over to the top. Looking down on the edges and knobs of Rambo V3.